We explain dry rot identification and repair and show you how to identify and repair dry rot issues in your home. Dry rot identification is essential if you want to remove any problems for good so in this guide we show you how to diagnose the causes of dry rot, what the difference between dry rot and wet rot is and what the correct dry rot treatment is for timber, stone and brick. This guide also includes pictures for help with identification. 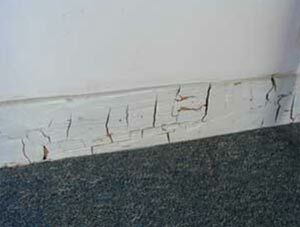 Dry rot is a fungus that, once it enters your house, can cause a great deal of damage to your timber. As with most issues that affect the structural integrity of your house, early detection and prevention are a lot easier and more effective than treating the issue when it’s been given time to develop – here we give you a guide to dry rot identification and dry rot treatment and also the causes of dry rot complete with plenty of dry rot pictures, as well as guidance on how to repair infected timber. If after reading through the project content below you would still like some further expert help and advice please give Property Repair Systems a call on 01626 336 180. All advice is free with no obligations. The term "dry rot" is somewhat misleading – this type of fungal decay was historically named "dry rot" to differentiate between rots that occurred in "wet wood" (i.e. newly felled timber) and "dry wood" (i.e. 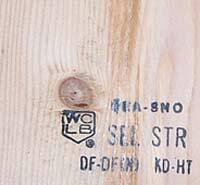 timber ready to be used in building). 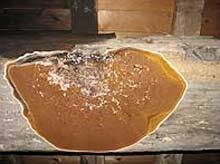 In fact, dry rot needs for your timber to be wetter than it should be to establish itself – typically your timber will need to have a moisture content of around 28 – 30% for the fungal spores (usually appearing as an orange dust) to germinate and produce hyphae, strands that develop into a fungal body known as a mycelium. Once the fungus is established, it only needs for your timber to have a moisture content of over 20% to survive, and it will develop hyphae (strands) that can travel across stone and brick to find more timber to colonise. This fungal colonisation causes what is known as "brown rot decay" – and the fungus that most commonly causes dry rot in the UK is known as Serpula lacrymans. The decay happens because the fungus feeds on your timber – it extracts water, hemicellulose and cellulose from the wood, leaving a brittle "skeleton" structure behind. This decay cracks the wood in a fine, square pattern, and also makes it crumbly and a darker or browner colour. Eventually, the wood will crumble into dust, which obviously could well cause parts of your house to collapse. 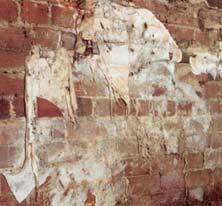 The rot won’t affect your masonry at all as it doesn’t feed on it – it simply travels through it. Dry rot can be present in your walls for months or years before the fungus appears on the surface of your walls, so even if there are no fungal bodies on your walls there may be rot in the wall itself. The easiest way to detect any rot in your walls is to use minimally invasive tools like Dry Rot Detection Sticks if you have any reason to think that your timber is or has been damp. Even if your damp problem has since been solved, as mentioned above any Dry Rot that colonised whilst your timber was damp may well still be there. Any and all of the damp problems that can affect a house can dampen your timber – examples include Rising Damp, Penetrating Damp, and damaged chimney and roof flashing. If you haven’t had a damp problem but think you have Dry Rot, this indicates that you do have a damp problem somewhere in your house. the area of your house affected by the rot will be a useful indicator of the type of damp problem you may be facing. 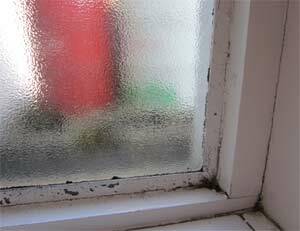 Take a look at our Damp pages for more information on solving any damp issues in your home. You must make sure that any damp issues are solved before you try and treat your Dry Rot – any treatments will become ineffective if your timber gets damp again as they will be diluted by the water, allowing the fungus to colonise again. What’s the Difference Between Dry Rot and Wet Rot? Wet Rot is caused by different fungi to Dry Rot, and it is generally easier to treat because it cannot travel across dry areas to reach other timber – it is confined to the damp timber area it originally colonised. Wet Rot also colonises timber that has a higher moisture content than the timber that Dry Rot colonises – this means that if your timber is really damp and then dries out some, Wet Rot will stop colonising it (as it is too dry for it) but Dry Rot will then move in as it is now "dry" enough for Dry Rot to colonise. Although these visual signs are a great way to identify whether you have rot (whether it’s Wet or Dry Rot) ideally you should try and catch the problem earlier as the rot may be present in your timber for months and years before the visual signs of the rot appear. This is why if you hire a surveyor to assess your rot damage, they will need to strip back some of your walls to examine exactly how far the rot has spread. This is obviously far from ideal, and so it’s great that there are products on the market that can allow you to detect any dry rot in your timber without stripping back your walls. 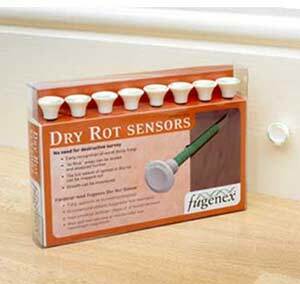 Fugenex Dry Rot Sensor Sticks are available from PRS here and these can be insert into a drilled hole in your wall. 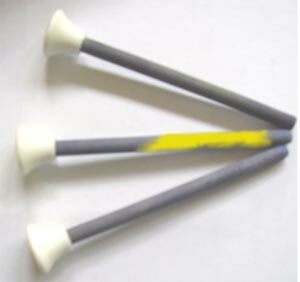 The blue dye in the stick’s stem (see the pictures below) turns yellow in the presence of oxalic acid, a product which only dry rot produces in any significant quantity. Not only does this mean that it detects dry rot without you having to strip back your walls, but it also helps you to identify whether your rot is wet rot or dry rot if there are fungal bodies or cracks in your timber but you’re not sure which type of rot is present – this is because wet rot does not produce the level of oxalic acid that the sensor reacts to. Dry rot starts producing oxalic acid before it has done serious damage to the wood, so with any luck you will be able to detect your Dry Rot with the sticks while the wood is still able to be saved with treatment rather than having to be replaced. To use the sticks, insert them into pre drilled holes in your wall that are 8mm in diameter and 110mm in length and leave the sticks in for 2 weeks before taking them out to read them. It doesn’t matter whether the stick is inserted along or across the grain of your timber, and you can insert the sticks in the outside facing surface of walls too. If you’re inserting the sticks in internal walls, a little bit of space should be left around the stick as it may swell. In external walls this is also ideal but you will need to be careful not to leave so much space that rainwater can enter. There is no minimum depth for the sticks to be inserted to, but it is ideal to insert them so that their full length is inside your wall (110mm). The sensor stick’s stem can also be read with a damp meter to identify if there is a damp problem currently present in your house. If you’ve used the sticks but you’d like further confirmation of exactly which rot is present and how far it has spread, PRS can offer you some expert guidance free of charge or put you in touch with your local rot specialist to come and take a look. 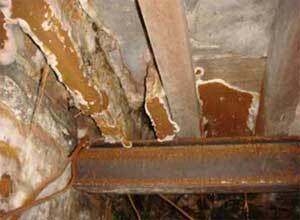 What is the Best Dry Rot Treatment and Repair Method? 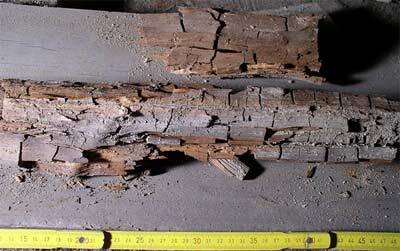 There are a number of ways you can treat and repair dry rot-affected timber. Remember that if there’s any indication that there is a damp problem in your house, you will need to find the cause of this and treat it before treating and repairing dry rot damage. This is because any new damp will dilute the treatment chemicals that you have applied – the dilution will happen because all of these chemicals are water soluble so that they can enter damp masonry and timber. If you do have Dry Rot present in your house, you should use the Fugenex sensor sticks mentioned above to understand how far the rot has spread in your house. If you’re sure that the rot is only present in exposed timber, i.e. exposed joists, then you will need to just treat the timber itself, along with any masonry that the joists are in contact with. Obviously, if your timber’s structure has been severely damaged by the rot, you will need to replace it (or get it replaced by a building professional). More information on which timber to use for different applications is available on the Timber Trade Federation website. Once this is done it is still a good idea to treat the surrounding masonry and timber as fungal strands may have already entered that area too – they can be invisible to the naked eye if they are small. If you have visible signs of dry rot on your wall as in the pictures above, or your sensor sticks indicate the presence of dry rot within the wall, you will need to strip the plaster off the wall and treat the bare wall underneath before replastering. 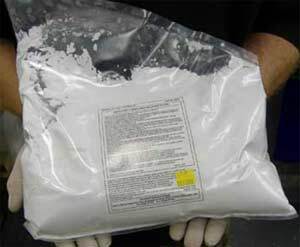 The best product to use to treat and kill Dry Rot in masonry is Boron powder dissolved in water. You can brush the Boron solution onto the affected masonry or spray it on depending on the size of the affected area and your preference. 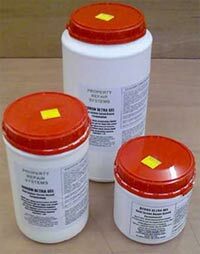 There are a number of different products available for dry rot treatment in timber. There are products that enter the timber itself as well as ones designed for coating the timber surface. Boron gel can be painted onto the timber surface, and comes in different concentrations depending on whether you want to prevent Dry Rot or treat it. Boron rods are rods made from highly concentrated borate that you can insert into holes you drill in your timber, and boron paste is a paste that you inject into pre-drilled holes in the timber using a skeleton gun – you may need to consult with a local specialist for guidance on the right hole spacing for your situation. If you have Dry Rot and mould and even insect attack affecting the same timber, you can treat all three with Boracol – a Boron and Glycol mixture. Once you have treated your affected area, if you have not applied a "coating" type treatment or you have treated your bare wall and replastered, you should also think about painting the affected area (this can be timber, masonry or plaster) with a special Rot Barrier paint – this is a special emulsion that stops any residual Dry Rot from travelling across the surface to reach more timber. 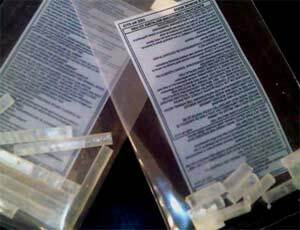 Any products containing Boron can be harmful – wear appropriate protective clothing when applying products and keep vulnerable people such as babies or older people out of the treatment area. Property Repair Systems stock all of these dry rot repair products and will be happy to advise you on product choice and concentration for your particular situation, as well as offering free advice on the identification of your dry rot. Call them on 01626 336 180.